September is now here. Everyone is joyously gabbing about pumpkin lattes and pulling out the scarves. Which suits me just fine because I absolutely adore scarves and hats and probably own way to many for a single individual to ever wear in a season. The exciting part of fall to me is curling up next to the fire place wrapped in blankets (which I also happen to have way too many of), drinking something warm, and reading a good book. I could say that I load up on galleys at this time of the year, but let's be honest--I load up on good books all year and use the season as an excuse. One of the great things about Netgalley has been developing new authors for my bookshelf. I have really come across some authors that have the potential to turn into the next legendary fantasy authors. Other times, I get the great opportunity to read a story from one of those legends. Disney Book Group allowed me that opportunity with an advance copy from fantasy legend herself, Mercedes Lackey. Mercedes Lackey is dipping her toes into the YA dystopia genre today. 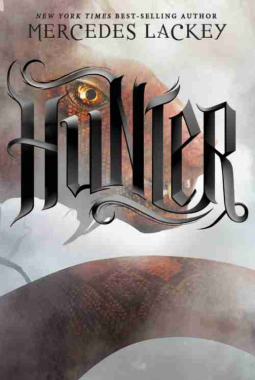 Her book, Hunter, releases in the United States. While she is not unfamiliar with writing for teens, she has entered the more modern, urban field of dystopia this time around. I am awed to have been given the chance to read this novel in advance. I am particularly torn on this review for that reason. I requested this book on the cover (which alludes to dragons) and the sense of a great fairy tale (this is one of the most published women of fantasy) to be told. The creatures from Otherside are taken straight from the pages of mythology. That part was an exciting approach for me. I just absolutely love the myths of old and their creatures, good and bad. It was also nice to see the more realistic approach to those mythological beasts. While shiny, remorseful vampires are all well and good, that is not their mythology or origin. Seeing them here all hideous and true to their history (and the slight author commentary/jab that went with it) was excellent. Where I got lost with this book was the obvious set up for why the Diseray happened to cause this future dystopia. The United States clearly ends up split between those who decide to be mindless sheep herded into safety by the military and preppers after some cataclysmic world event. I am just honestly a little tired of these attempts to satire our modern culture as an attempt at a wake up call (but then again, that is what literature is all about). Fans of the dystopia genre however need to pick up this book. Lackey introduces a very cool dystopia for which to be a part. The story moves along a little sluggishly for my tastes and could have used a more guided hand on the editing process for where to cut and where to add a dash of excitement. We spend most of the story being set up for the final two chapters without much to entertain us in between. This left the ending feeling a little anti-climatic. Clearly this was meant to be a trilogy from the start. If you are familiar with the author at all, then you should have been expecting it. We didn't need the half-hearted cliffhanger to get us there. At most, I give this novel 3 stars. I recommend it to die hard fans of Mercedes Lackey or those of the dystopian genre just so you can say you have read them all. Otherwise, readers looking for that sense of entertainment and wonder--pass.